Is my limit on a free account only 5 forms? Olá. Está aparecendo para mim um limite de formulários, aparece que estou usando 30 de 5. Como é isso? Meu limite em uma conta free são só 5 formulários? Veja a imagem abaixo. Não estou entendendo esse aviso. Hello. A form limit is appearing for me, it appears that I am using 30 of 5. How is this? Is my limit on a free account only 5 forms? See the image below. I do not understand that warning. You are our old user, you created your account at 2013. We have limited the form creation lately. However, the old user's all forms were grandfathered. 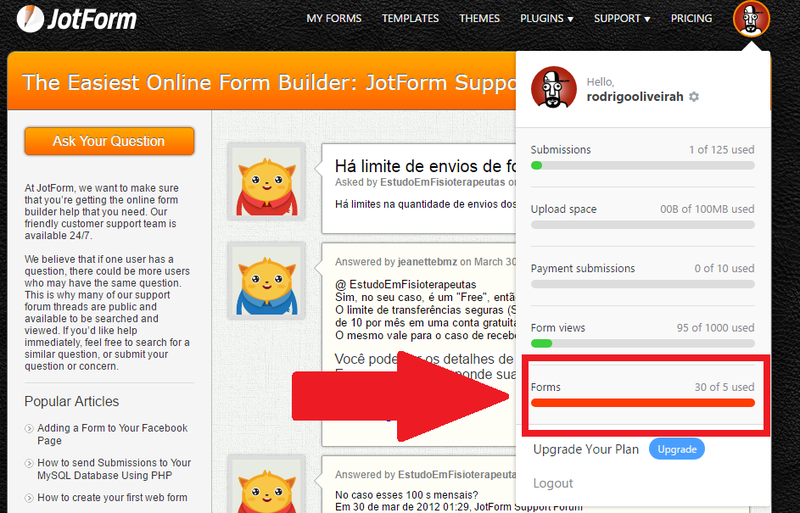 The only thing, you can not create a new form on your free account. There was a sudden change in the boundary.